Once upon a time, in a city known as New York, I used to spend many many hours in a little theater in the basement of a Gristedes super market. For this was the place where wonderful things happened. Monologues were spoken and scenes were created out of thin air. This was the fortress of black painted walls and scuffed stage. This is where sweat and theater chairs all came together in the name of long form improv devised by the god Del Close. Can I get a “Yes, And” and a “Don’t Think?” How about a suggestion? The Upright Citizen Brigade Theater in New York (Chelsea to be exact) was my home for a few years. The founders are Matt Besser, Ian Roberts, Matt Walsh and Amy Poehler, who in 1996 broke off from Second City in Chicago to build their own improv company in New York. Over time, it became the spawning station for writers and performers of SNL, 30 Rock, The Daily Show, Conan, Fallon – etc. You could mingle with people doing kicking comedy and then tune in NBC and watch them alongside Tina Fey or Lorne Michaels. I needed comedy back then. Badly. I was juggling the health and welfare of two ill and aging parents. I needed to dive into the happiness of the UCB. I went down to the basement to get over the darkness. The UCB saved my life. (A commentary I’m saving for another blog). Walking down the long set of stairs to the lobby and box office was a little like heaven. The musty air smelled like my childhood home basement. The photos on the wall showed many comedians who were once part of the nightly fun, playing a game of improv in teams created in training classes or over massive amounts of beers at McManus. I performed on the UCB stage as a student, having joined my class for graduation performances where we’d use the techniques taught over several weeks to make our friends and family laugh. It was the most terrifying and fun thing I’ve ever done. I miss it from time to time – having moved to Los Angeles where I didn’t get involved with the west coast theater (other than going to plenty of shows) as a student or volunteer. But the only thing I love remembering is the graffiti around the UCB NYC stage entrance, especially one very interesting reminder right near the entrance curtains: “Leave Your Farts Here.” I only hope that comment was there when Robin Williams joined the Harold Team “Bang” back in 2008 for a show. It would be one thing we would share in the comedy universe. One of the shows I used to see was “Death by Roo Roo: Your Fucked Up Family”. 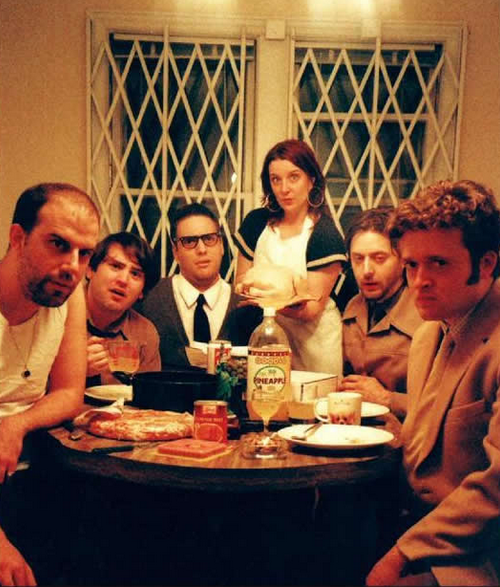 It’s been a staple Saturday night show at the UCB in New York for years and years – surviving the transfer of their original performers (as seen above) to the west coast where they are all guest starring in prime time comedies and/or writing on cutting edge shows like “The Walking Dead”. “Roo Roo’s premise: An audience member with a really screwed up family story comes up on stage to talk about their, well – fucked up family. The team of improvisors glean their improv from the stories told and hilarity ensues. It’s a great show that would also be performed on the UCBLA stage. December 13th will mean curtains for Death By Roo Roo. It was ground zero for some very talented people whose stars are on the rise. Time to make way for another generation of improv shows that will have people lining up down 26th street toward 9th avenue. Categories: Wednesday Coming Down | Tags: Death by Roo Roo, Robin Williams, The Upright Citizens Brigade, UCBLA, UCBNYC | Permalink.